There’s no better way to advertise your olive oil soap than with Olio di Oliva right on the bar. 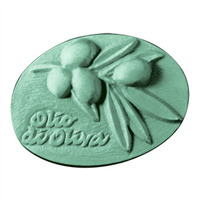 Along with a beautiful olive branch as decoration, our Oliva soap mold is perfect for handmade olive oil soaps. 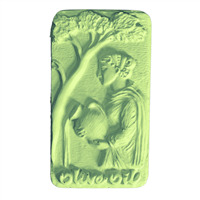 This mold shows Aristaeus; the Greek god of cheese making, beekeeping, honey and honey-mead, and olive growing and oil milling; pouring out a vessel of olive oil underneath an olive tree. The words OLIVE OIL are in cursive at the bottom of the mold. Let your customers know that your soap is made with OLIVE OIL by literally writing it on the bars! 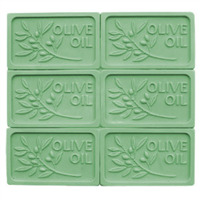 The Olive Soap Mold Tray also features a simple yet beautiful olive branch design and makes six rectangular bars.